Beasts of No Nation, concocted almost single-handedly by Cary Joji Fukunaga — or that guy who brought us True Detective season one — has been touted as potential player at next year’s Academy Awards. The catch? It would be the first Netflix original to rub shoulders with Hollywood’s elite on their golden night. Its online distribution platform may well be the future of entertainment (hopefully not exclusively), but the film itself is rooted in the past and present, telling a story of violent civil war in West Africa. Fukunaga (director, screenwriter, cinematographer) patiently paints youngster Agu (Abraham Attah) and his family with endearing strokes: once a teacher, his father is now a humanitarian clearing land for refugees; his mother evokes a loving aura, carrying out maternal and manual tasks with a smile; and his aloof big brother is your typical teenager, obsessed with muscle mass, girls, and having a laugh. Agu himself is smart egg, a kid full of sneaky creativity. He deconstructs his father’s TV and rebrands the empty frame an “imagination television” hoping someone will fork out some cash or food for it. Granted, there is a significant military presence in the unnamed village and displaced groups are struggling to find a place to settle, but life for Agu is fairly good given the circumstances. That is, until war truly makes its presence felt. “Nothing is ever for sure and everything is always changing,” narrates Agu. And everything does change, horrifyingly so. Separated from his family, Agu finds himself lost in the bush and about to unwillingly travel down a path paved in unethical stone. For at this point Idris Elba’s Commandant swaggers on-screen, an eerily charismatic rebel leader who hypnotises with words, poisoning the minds of those too inexperienced to think for themselves. Elba suitably commands, persuasive in posture and delivery. Head of the Native Defence Force, his followers parade a faux-macho exterior, wagging weapons and wearing the surrounding landscape as a battle uniform. Agu, now with nowhere else to go, falls in line and begins his training as a child soldier. As words such as “family” and “father” ring out, you can see Agu’s resistance collapsing and his loyalties shifting towards Commandant’s bloody policy. The latter trains his young army to understand stringent battle formations and inflict uncompromising punishments, all the while a soundtrack of propaganda wails out in the background. The soldiers also play football, albeit more aggressively than normal, a fleeting reminder of their humanity. Once in battle mode, the situation turns to abhorrence: one particular execution is horrid, but thankfully (admirably) Fukunaga doesn’t gratuitously linger on the visual. It’s not that type of film. 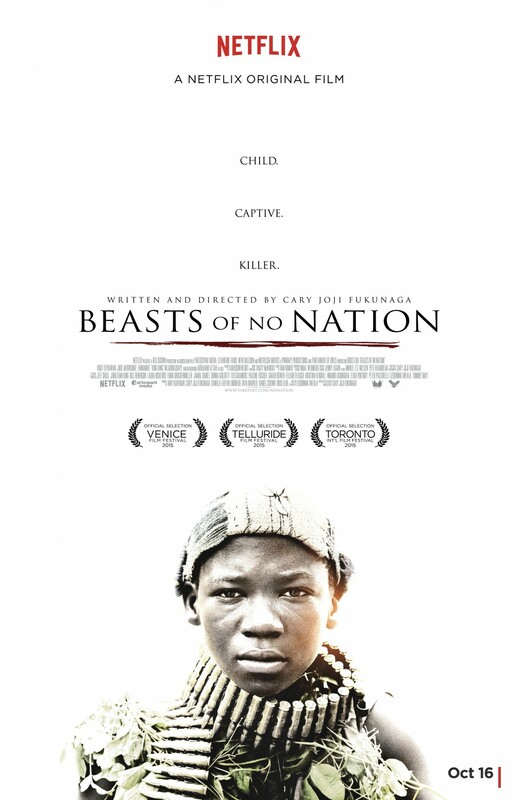 Rather, Beasts of No Nation wants to convey the very real dehumanisation of children via war and mind-warping. The sieges that we see are so impersonal, so chaotic, that it is difficult to tell who is killing and who is dying — and that’s the point. One such invasion is painted red even before blood has been shed, ominously predicting the inevitable while also projecting the drugged-up mindsets of the invading adolescents. Fukunaga’s lens work gives character to the jungle; shots of mossy foliage landscapes wonderfully signify the denseness of the locale, parading this idea that there is no escape, not even for the rebels. It is a notion best captured early on as Agu attempts to escape a band of gun-toting killers: Fukunaga pulls his camera back, carefully revealing the contrast between the vibrant jungle ahead and the smoke-filled decimation in the youngster’s rear view. The environment transcends reality: the aforementioned coaching sequences, engulfed by mist, are loosely reminiscent of those swampy Dagobahian sessions in The Empire Strikes Back. Blood Diamond is a clear cousin: the setting, the narrative, the relationship between Agu and his family — these are all shared characteristics. But Fukunaga’s piece doesn’t have said outing’s heart. While the lack of direct Western involvement is entirely justified (character or plot-wise), the lack of a determined, soulful saviour hurts. In Blood Diamond, that saviour is Djimon Hounsou. He plays the father of a young child solider and his stunning performance imbues Edward Zwick’s film with hope and humanity, traits that are somewhat lacking on this occasion. You find yourself yearning for a Hounsou-esque force in Beasts of No Nation, particularly as Commandant’s poisonous grip over Agu gains momentum, but there simply isn’t one. There is also very little grace — some might argue rightfully — and this causes you to pull away from proceedings. Without a father figure valiantly attempting to save his son, there is nothing really to tow you back in. 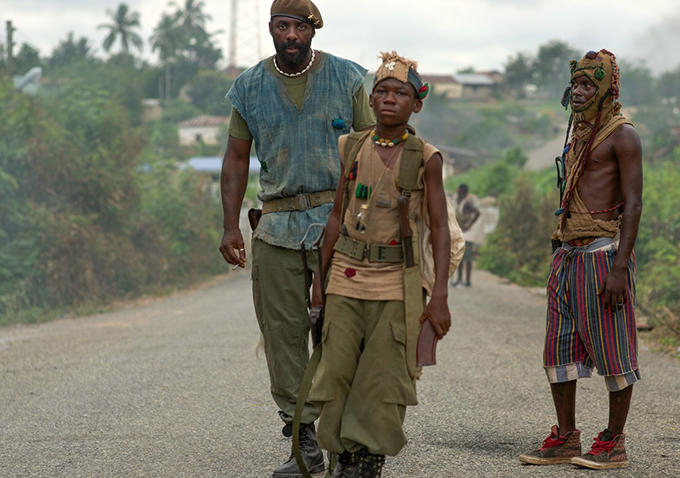 Abraham Attah is a true revelation as Agu, his transformation from bright boy to corrupt soldier disheartening, but also lacking in any semblance of goodwill. Emmanuel Nii Adom Quaye is equally as good as Strika, another fighter with whom Agu bonds, yet unfortunately the duo don’t share enough screen time to truly generate a sense of collective humaneness. I think the film is too long. Scenes reap repetition by the 80-minute mark, though this could be a measure employed intentionally to emphasise the gruelling nature of war. Fortunately, it does begin to incorporate some political elements in the third act; we hit an urban centre where Commandant engages in a verbal joust with another NDF head honcho. As they barter back and forth over payment, leadership, and resource deployment, The Last King of Scotland springs to mind. Had Fukunaga cherry-picked a tad more from his aforementioned genre ancestors, he could have been onto a classic.